Travel tips and inspiring ideas for a memorable trip to the USA! All UK travellers to the US should be aware that effective from 1 April 2016 UK citizens must have an electronic passport (e-passport as shown by the symbol on the front cover of your passport) to be eligible for visa-free travel to the United States. Even if you have a current ESTA you must have a UK e-passport for this to remain eligible for travel to the US. For more information click here. The US has so much to offer UK visitors, but if you’ve never been stateside before, getting the right travel information and guidance is essential. 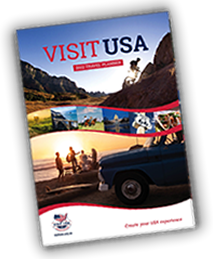 Visit USA is dedicated to giving you that support when you’re planning your trip to the USA. Our extensive guide to visiting the USA will provide you with helpful tips that will make your trip go as smoothly as possible, as well pointing you towards holiday offers and relevant travel brochures. There are plenty of states to choose from, and they all offer something unique. As part of this guide, you’ll have access to comprehensive US state information. It’s important to know what each part of this vast country has to offer because that will help you to make informed decisions when you’re planning your US trip. Whether you’re looking for a holiday to catch the Californian sun, explore the NYC metropolis, marvel at Colorado’s natural beauty or head somewhere else entirely, you’ll find all the information you need right here. If you’re feeling daunted by the prospect of a trip to the USA, just browse through our range of tips that will help you feel more confident about your plans. You will learn about experiences and travel opportunities that might never have occurred to you before, and it’s often the small things that make a trip worth remembering. Our blog section will fill you with tips and travel options that could make it all that little bit more special. Your options are limitless when planning a trip like this, so the more you know, the better placed you’ll be to experience a trip of a lifetime. At the same time, everyone wants to get value for money on holiday. The Offers section of our website will provide you with discounts and cheap deals that will help make sure you have plenty of money to spend while you’re away. American holidays are always more enjoyable when you feel like you’re grabbing a bargain, and we understand that feeling. There is no shortage of offers and deals for you to browse right now, so what are you waiting for? You can find out about News items on our website as well. We’re committed to providing you with a comprehensive understanding of what you can expect from your trip to America. When you travel to the USA, you want to know what to expect and what you can see and do during your time there. Make sure you check out this part of the site if you want to expand your knowledge and learn more about what’s on offer in the USA. If you are looking for ideas, we can help out with that too. We’ve got guides to suit everyone’s needs. We’re full of ideas for your American travel trip and it’s our pleasure to share them with you. Check out the Ideas section to uncover new experiences that you might want to take forward and make your own when you eventually touch down on American soil. 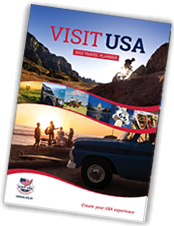 Our latest Travel Planner is an essential read for anyone thinking of taking a trip to the USA. You can view the digital version of the Travel Planner right now. It will provide you with all the inspiration you need for your trip to America. Holidays in the USA come in all shapes and sizes; we know how hard it can be to make that final decision on what you want your holiday to look like. But by the time you’ve read the 68 pages of our Travel Planner, which is updated and republished each year, you will have a better idea of what you want to spend your time doing. The state map will also help you get a better idea of what the different areas of the country can offer when you are visiting the USA. Why not explore the US States, with our state map, and individual state guide? You can combine this information with all the up to date tips and ideas that you can find in the Travel Planner and elsewhere on the site to construct a trip that’s right for you and your friends or family – one that will be ideal for everyone. Our site truly is a one-stop information resource for all things related to US travel and trips. 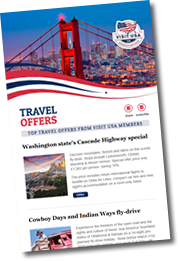 We’re always adding to the wealth of information on offer here, so keep stopping by for more tips, more ideas and more offers that will help you make the most of your visit to the USA.